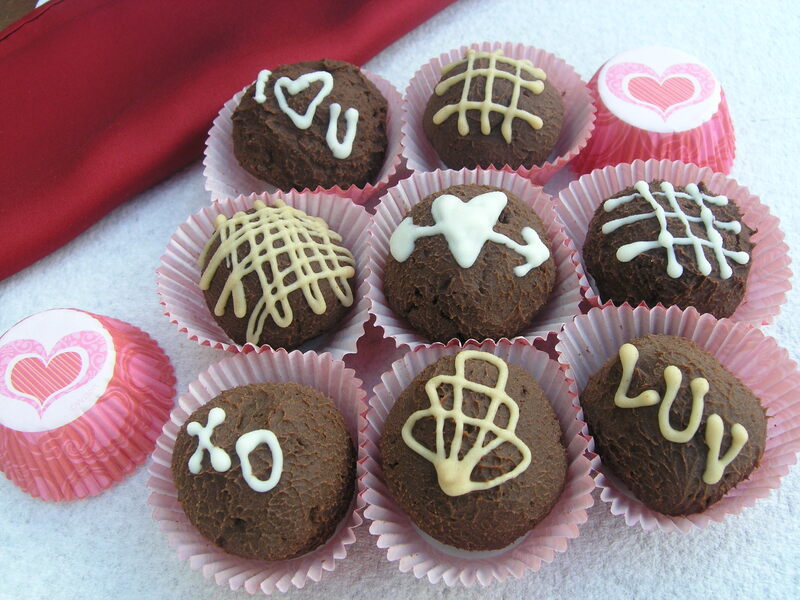 Chocolate truffles are a great gift to show a person how much you care about them the Valentine’s Day. Once you have a sound basic recipe, there are unlimited ways to personalize the truffles based your recipients favorite flavors. The truffles are rich and insanely chocolatey, but still take on almost any flavor. For example, the truffles pictured below are 1/2 peanut butter and jelly (decorated with peanut butter) and the other half have Whopper malt balls in the center decorated with white chocolate; two of Ryan’s favorites. Some other examples would be lemon rosemary (for my mom), chocolate chili with sriracha (for my sister), and truffles stuffed with cookie dough (for my dad). The flavors and endless and really show someone that you pay attention to the things they love! * I used one 10 oz bag of Ghirardelli 60% cocoa chips, and 1 scant cup semisweet chips. The darker, the better, as the truffles will be way too sweet if you use anything lighter than semisweet chips. 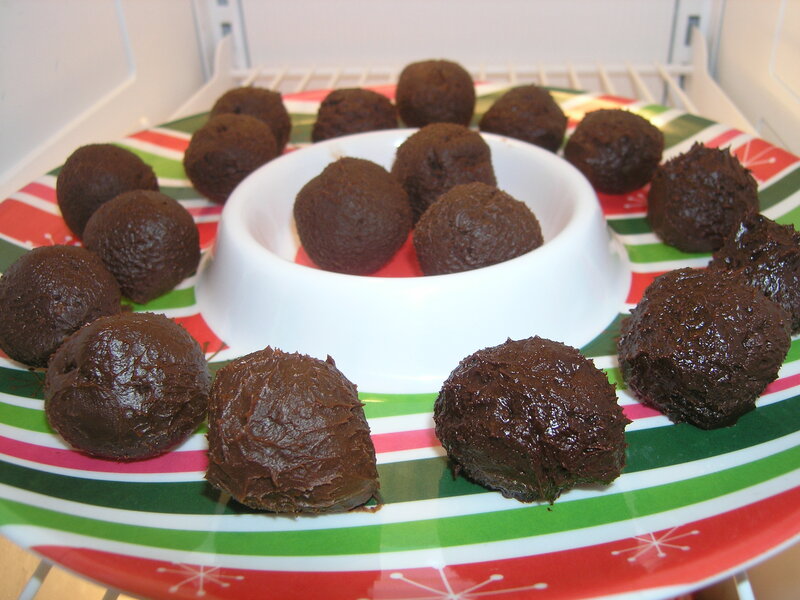 For truffles: place dark chocolate in a microwave-safe bowl and put two sheets of paper towel on the counter top. This is where your spoon always goes after stirring. As my favorite pastry teacher in school always said, “Chocolate isn’t messy! YOU ARE!”. Anytime you use a spoon in chocolate, put it on the paper towel. 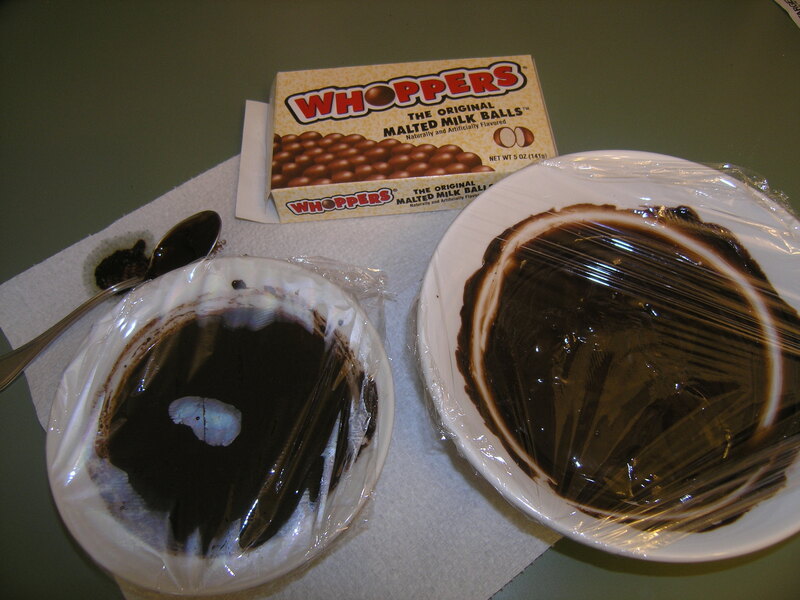 Microwave the chocolate in 30 second intervals until the chips are melted thoroughly. Stir between 30 second intervals, as sometimes that helps the melting more than excess time in the microwave. Once melted, stir in the heavy cream, vanilla, coffee, and liquor. Really stir it in well, using a rubber spatula if needed to get it all incorporated. At this point, you can divide into smaller bowls for multiple flavors. I suggest dividing this recipe into no more than three flavors. If you divide into three, add 1 tsp extract, 1 tbs zest, or 1/4 cup flavoring for each flavor. For example: 1/4 cup peanut butter and 1 tsp raspberry extract for peanut butter and jelly. Or 1 tbs lemon zest and 1 tbs finely chopped rosemary for lemon rosemary truffles. Taste the chocolate after you add the flavorings to make sure that it is strong enough for your liking. Cover with plastic wrap and let the bowls sit at room temperature for one hour. After the chocolate has set, use a spoon to see if it has hardened to be paste-like. Depending on the weather, humidity, etc.. it may not be thick enough. Try rolling a tablespoon-sized ball in your hands. If it’s mush and won’t roll into a ball, place in the refrigerator for no more than ten minutes! Roll the chocolate into bite-sized balls (a scant tablespoon) and set on a sprayed cookie sheet. If you are stuffing them, scoop some chocolate and place the center filling in the middle of the spoon, and then roll into a ball. If your hands become too warm doing this, rinse them with cold water between truffles to keep the chocolate cold. When they are all on the cookie sheet, refrigerate for 10-15 minutes until the outside is firm. To decorate: there are a few options for this. The simplest is to use a sieve and sprinkle cocoa powder or powdered sugar over the top of the truffles. They are traditionally done with cocoa powder, but powdered sugar adds a sweeter touch. For something slightly more elaborate, melt 1/4 cup white chocolate chips in the microwave (30 second increments again) and stir in 1/2 tsp of vegetable oil to make it loose and runny. Use a finely tipped squeeze bottle or a fork to drizzle decorations on the truffles with white chocolate. If you have flavored truffles, I like to make that apparent with the decoration. For peanut butter, melt 1 tbs peanut butter in the white chocolate. For lemon or orange, top with some fresh zest. Refrigerate for another ten minutes so that the decorations harden. Place in the truffle liners and refrigerate in a covered container until ready to serve. They last up to three weeks refrigerated, but should be served at room temperature for melt-in-your-mouth goodness. After Part II of the recipe: truffles rolled and in the refrigerator to cool. Ignore the tacky holiday plate; we are currently staying at a furnished house that lacks some sophisticated plate ware. After Part I of the recipe. Chocolate ganache (with fillings mixed in) sitting at room temp for one hour. I want to do caramel and sea salt! Let’s have a baking day together! Looks decadent…I’ll make them and let YOU EAT THEM!